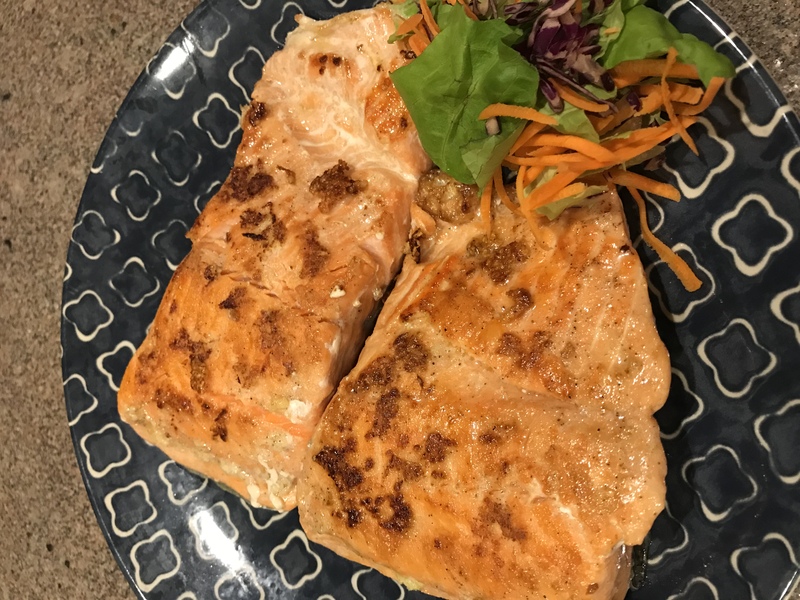 I love salmon, and this recipe makes it even more lovable because it is moist with a little crispiness in the outside texture and garlic in the flavor. I hope you like it! Mince 2-3 cloves of garlic and rub onto 4 salmon filets along with a little olive oil, salt and lemon juice. Set the filets in the oil mixture and refrigerate for an hour or two. Get a skillet hot, to medium heat, and cook the marinated salmon for 5 minutes on each side or until it flakes with a fork and loses its dark pinkness. I like to cover the skillet with a lid to hold in the steam for the first 5 minutes. If you give both sides that much time and it still doesn’t seem done, repeat for 3 minutes on each side. Let it get a bit crispy. Serve with a baked potato and steamed green beans for a lovely meal. For tartar sauce, simply stir 2 Tablespoons mayo with a teaspoon lemon juice, 1/2 teaspoon dill weed and a sprinkle of salt.